A few years ago, I was looking for an antique vanity for my daughter’s room. I ended up having to drive out of town to pick-up my Kijiji purchase, but when I got there I found out she had a second vanity, a dresser, a little cabinet and bench. She was really wanting to get rid of the stuff and if I remember correctly, I got everything for around $60. I don’t remember the exact amount, but it was cheap. I took all the pieces and sanded, repaired and painted them over time. Here are the original pieces. I actually still have one of the vanities (not in above photos) that I have not yet completed. The little cabinet (on the left in the last photo) was not an antique, but was old and built well. 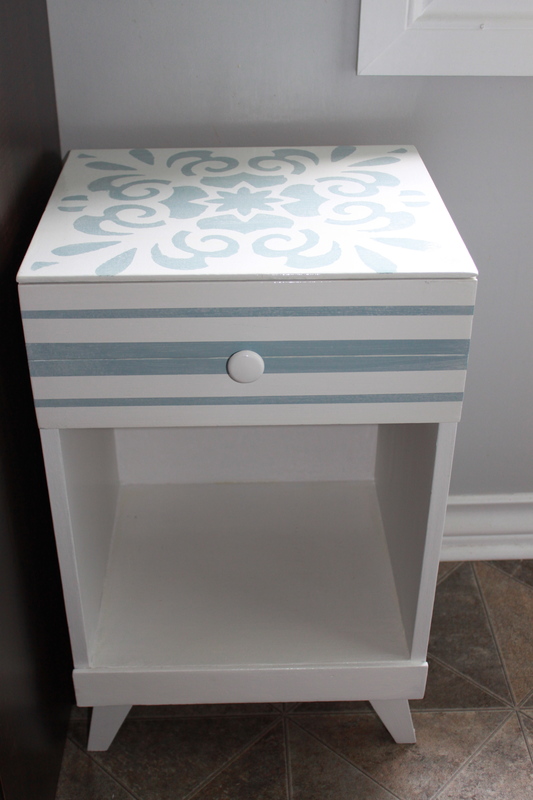 I painted it out and used a dollar store stencil to decorate the top. It now sits in our kitchen below our menu board. I love the finished look and the cabinet virtually cost nothing as it was thrown in with my other purchases. Posted on September 5, 2013 by Cindy Roy •	This entry was posted in DIY and Upcycling and tagged cabinet make over, DIY, DIY projects, painted furniture, upcycling. Bookmark the permalink.